The equipment used to pull of this feat (mass-selective photoelectron circular dichroism or MS-PECD ) is no doubt extremely complex and expensive. As a physics paper it is crammed full of jargon and Wikipedia is not helping at all. The closest thing to an article on this topic is photoelectron photoion coincidence spectroscopy. As the article at hand explains a molecular beam containing the analyte is irradiated with circular polarised laser light at right angles. Ions and electrons then shoot away in opposite directions on the third axis. The ions continue their flight as in regular MS and are detected at detector 1 by conventional ToF. In the opposite direction the electrons are traced by velocity map imaging. The resulting MS diagram is nothing special and just show the two molecular ions of limonene and camphor. The electrons are a different story. They strike the detector at the same time as the ions so the signals are tied. With any analyte exactly 50% of the electrons are moving one way to hit the detector but with chiral molecules more electrons shoot away at one specific angle. The asymmetry can be 1 to 10 percent, enough to assess the enantiomeric ratio. And that is exactly what the article is about. Bonus points! The article is published open access and under a creative Commons license. This means that for once I can use the image displayed on the left (not mine!) without having to worry about commercial publishing house lawyers raiding the office! It is time to fool around with chemicals. The Journal of Chemical Education regularly publishes about igniting stuff, a long tradition dating back to 1930. In a recent issue McGuire et al have another look at the thermite reaction (DOI) of iron oxide and aluminium. The hazards section reads: "an outdoor setting is preferable" and "observers should be situated well back from the reactions, at least 15 or 20 feet from the estimated extent of the reaction". This is going to be good. The reaction of Fe2O3 and Al mixed together to form elemental iron (molten!) and Al2O3 is exothermic but requires a serious kick-start. The authors heartedly suggest a mixture of potassium perchlorate and sugar to be added to the mix. A few drops of sulfuric acid will set the fireworks in motion. As the authors explain sulfuric acid and KClO3 initially react to form KClO3 and K2SO4, the KClO3 then oxidizes sugar in a reaction that generates sufficient heat to decompose the bulk of the KClO3 to KCl and oxygen. Sugar and oxygen then provide all the energy to get the thermite reaction started. The people at Sanofi continue to tinker away at their industrial production of artemisinin. 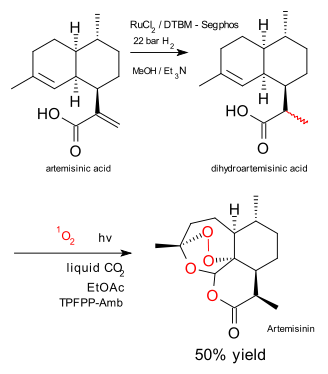 As described in a previous blog episode here the starting compound artemisinic acid (produced from glucose) was converted to artemisinin in subsequently a hydrogenation, an esterification and an Schenk-ene step with one equivalent of singlet oxygen. In new research described here (Nature Chemistry, Zamara et al.) the Sanofi group and partners demonstrate that the esterification step can be done away with and replaced by a direct Schenck ene oxidation. The new approach is a lot greener. The new features are: liquid carbon dioxide solvent (not the same as supercritical carbon dioxide! ), ethyl acetate co-solvent, a solid porphyrin / amberlyst catalyst and a continuous-flow photochemical reactor. Reported yield 50% at 90% conversion. Just for how long are photochemical reactions in industry considered of just great potential? The authors cite a G. Ciamician as a true believer. Problem is the guy wrote about it in 1912. This must be the most damning quote of 2015 in chemistry land: "Computational predictions vary vastly, and it is not clear that any significant accurate information that was not already apparent from experiment could have been garnered from computations". The authors are Erik Plata and Dan Singleton (DOI). It is thanks to Arthur Winters news&views contribution in the June issue of Nature Chemistry (DOI) that this blog has become aware of their article (sorry!). It has already been making some waves at C&EN, Computational Chemistry Highlights and In The Pipeline. So what was it all about? Plata and Singleton experimentally reinvestigated the kinetics and thermodynamics of a typical Morita Baylis-Hillman reaction (MBH reaction) and then compared the results with different computational methods. On a simple level the MBH reaction is a simple Aldol reaction / elimination but as Plata and Singleton explain (and Wikipedia can confirm) researchers like McQuade and Aggerwal made much more of it, for example introducing proton-transfer effects. Practical complications: the model reaction chosen is an equilibrium reaction, reaction intermediates can be protonated and their precise concentration may not be known. In the end it all boiled down to the generation of an experimental free-energy profile with a total of 5 activation barriers. Main conclusion: The "simple" MBH reaction mechanism is the most viable. Surprisingly the computational profiles did not even get close. It was like a weather forecast for next week with temperatures not more precise than between -5° and 30 °C. Calculated equilibrium constants were off by 10 to 25 orders of magnitudes. Activation energies varied by 50 kcal/mole. In several predictions the overall reaction was supposedly endothermic. So what went wrong? Plata and Singleton are not very specific except when they state that entropy effects are not part of the problem. In their view many different computational predictions can be made for any given reaction and only the absurd ones are dismissed. Arthur Winters in his commentary notes that "experimental chemists needn`t fear being replaced by computational overlords in the immediate future" and asks the question if "abstinence (is) the best approach for computing reaction mechanisms that are challenging for current theory". The solution would be to be more careful. In any event "the terror of having ones work discredited in the footnotes of a future Singleton paper is sure to cause some computational chemists to wake in the occasional cold sweat in the early hours"